To knit or not to knit, that is the question. 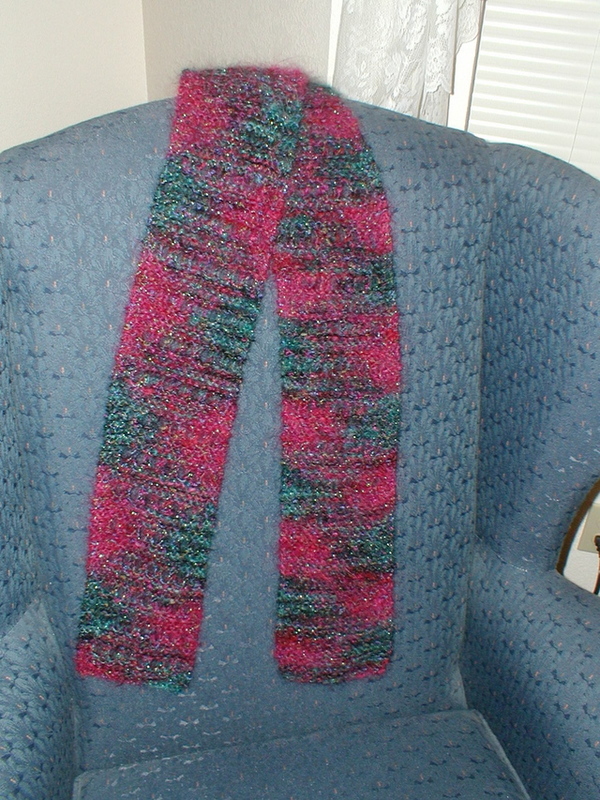 Well, not in general, but specifically I’ve been pondering whether to continue in the Six Sox Knitalong. I guess I should make a decision today because the next pair is due by the end of November and I haven’t even started! I would like to start another pair of socks, but think I want to pick something on my own. I haven’t been too happy with the fit on the last two pair. And, since I just don’t have the time to keep up with the posts, I’ll probably just drop out. I’ve been such a good girl about not starting anything new and have actually finished a couple of things. 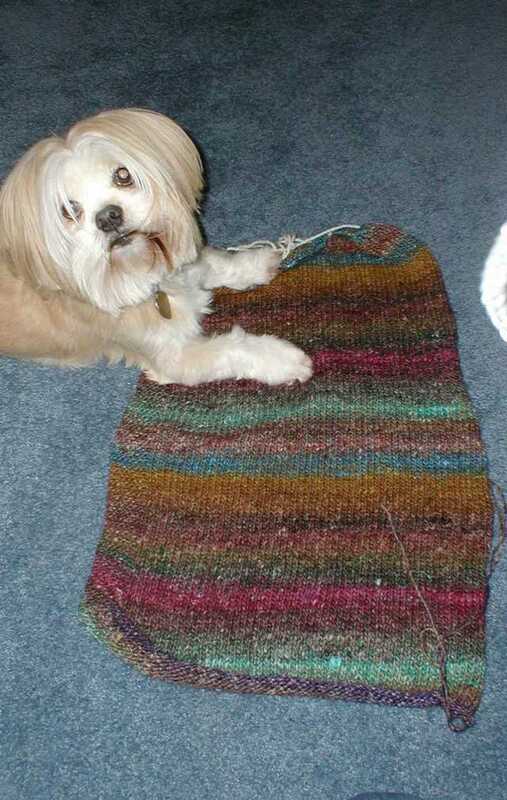 This was a baby afghan I started just to have something to put aside for a shower gift. Last weekend I really needed the emotional satisfaction of completing a project and it was the closest, so I did. And I completed this last night. 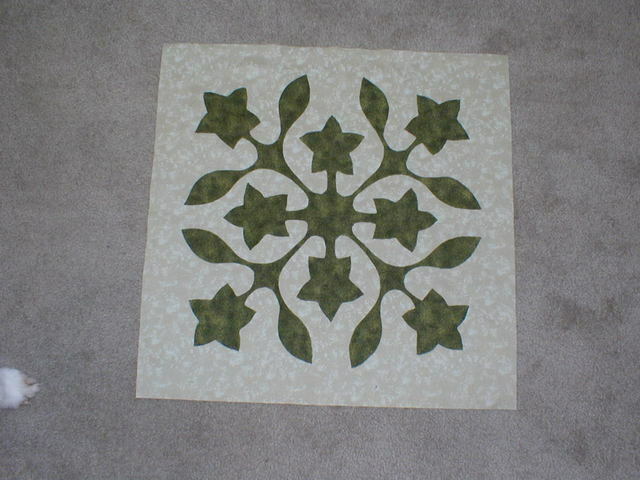 I know, it’s not knitting, but most of my friends know me as a quilter, not a knitter. 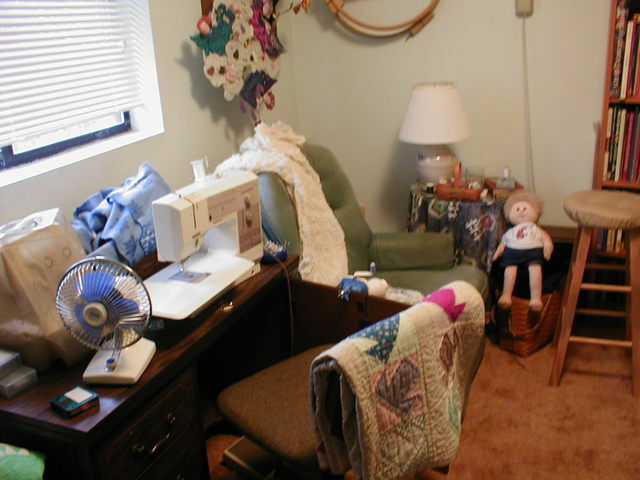 In fact, I got some puzzled comments from them when I started my blog – “Why knitting?” I don’t know – is there a quilting blog community out there? For Thanksgiving we did something new and volunteered at our local community Thanksgiving Dinner. This was started three years ago by a local restaurant owner. For years he had provided free dinners at his place for the needy. With the help of the local Elks Club he decided to throw it open for the entire community. All are welcome, whether they can afford it or not and donations are accepted from those who are able. It is already becoming a tradition for those who don’t have family around and even for those who do – entire families come and a great time is had by all. My husband, sister and I spent the afternoon delivering dinners to those who were housebound and to employees at the few businesses that were open. On a sad note, the man who started the whole shebang was out back cooking turkeys when he had a heart attack and died. But I couldn’t help thinking – what a way to go. He was doing something he loved, feeding others, and has left a wonderful legacy. I think the community dinner will go on because of him. Tomorrow it’s back to work after six days off. Sigh, it’s always hard to go back, but I’m usually ok once I get there. More term papers and finals due so I’ll be busy for the next few weeks, but will try to post. I’m hoping to finish another project this week. 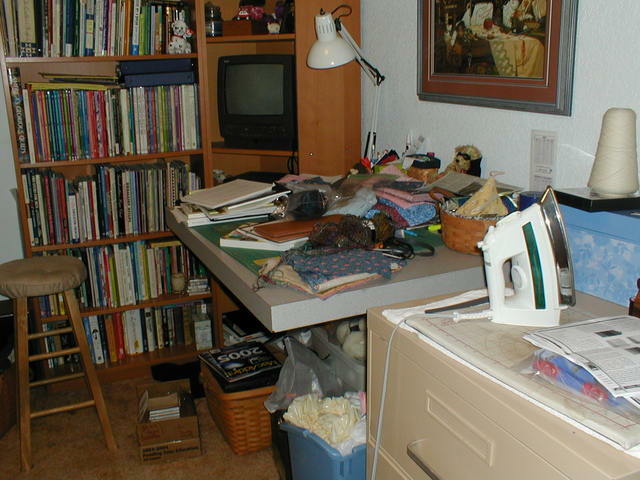 My sewing room (actually, I think I’ll start calling it my “studio” – so much more elegant) regularly gets like this. When it gets really bad, I go on an all day cleaning jag, get back to square one and always promise myself I will NEVER EVER let it get this bad again. And then, a week later . . . well, you get the picture. My husband says the same thing happens with his shop. Somebody stop me! Before Christmas I have the following on my plate: three exams and three term papers, one promised Christmas sweater (about ½ done), an appliquéd square for my Round Robin group (barely started), two hats for our knitting group’s Christmas project, assorted Christmas parties, and of course, work, housework and normal daily responsibilities continue. And this doesn’t include the two sweaters sitting in the basket waiting to be sewn and the two (yes, count ‘em, two) Norwegian sweaters started. 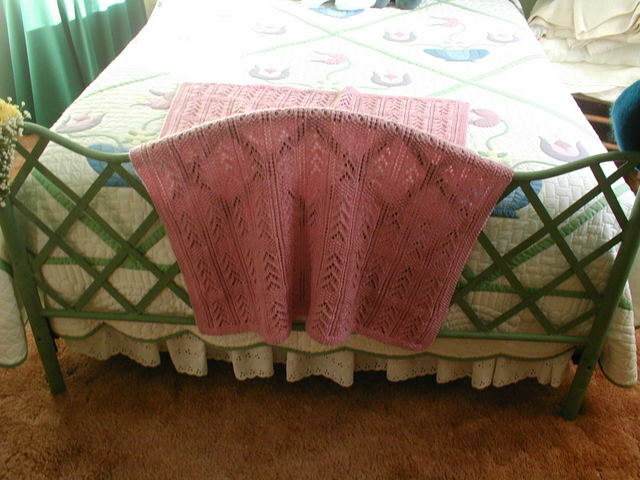 Oh, and the Mediterranean Shawl sitting in my sewing room with the border half frogged. Yet, all I want to do is start something new. I bought Cat Bhordi’s book, Magical Knitting (see sidebar) and all I want to do is cast on for one of her beautiful Moebius scarves. I need to have my head examined! However, I am making progress. 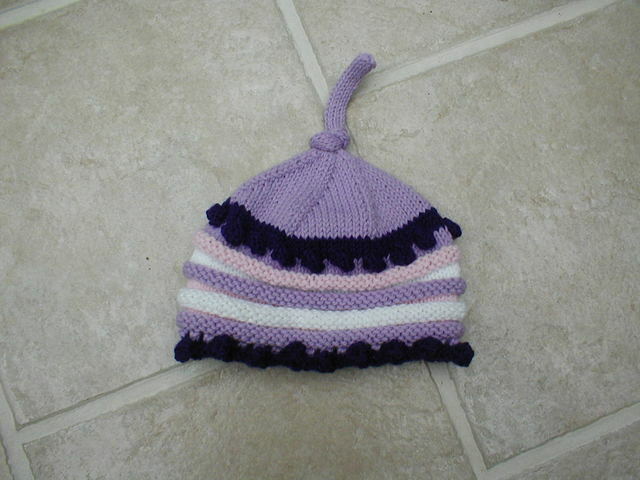 This is the first of the two hats for the Christmas project. Our knitting group is making hats for Children’s Hospital in Seattle. This is such a great project. The 12-year-old son of one of our members has a number of serious medical problems and has to make regular trips down to the hospital. He dreads these visits so much because they are never pleasant. But we have made him our emissary and he is responsible for delivering the hats. His mom said for the first time he is so excited about his visit to hospital because he gets to hand out hats. Neat, huh? So far I think we have over 50 of them! And this is a picture of the side panel for the Christmas sweater. The pattern is Tilt and is great fun. The yoke takes a lot of concentration, but the lower side panels are a no-brainer. Haven’t looked as far as the sleeves yet, but putting it together is a breeze – three needle bind off throughout with the bind off showing on the outside. I did discover one time saving device. If you haven’t signed up for Bloglines yet, do so now. It is so nice for keeping up on your favorite blogs, especially those (like mine) that don’t post daily, or even on a regular basis. I have put a link on my sidebar. I’ve found that it doesn’t work for all blogs – you have to have an RSS feed. But please don’t ask me what that means or how you get it if you don’t have it!! One other thing that I would love to learn more about, but simply don’t have the time.